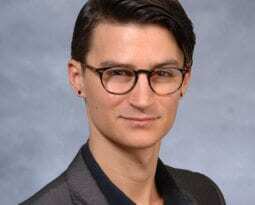 Joel Michael Reynolds is the 2017-19 Rice Family Fellow in Bioethics and the Humanities and an Assistant Professor of Philosophy at the University of Massachusetts Lowell. His research and public engagement center on foundational issues concerning ethics, society, and embodiment. What does flourishing mean in the genomic age? How can one be ethical in an unjust world? How do our bodies shape experience, understanding, and judgment? Seeking to bring reflective and empirical insights together, he engages work across the humanities and social sciences, with special emphasis on the role of narrative and lived experience. As the Rice Fellow, Joel contributes to the new Hastings Center Initiative in Bioethics and the Humanities, supported by a National Endowment for the Humanities challenge grant and private donors. Among other topics, Joel’s research for the initiative focuses on questions of genomic responsibility and other ethical, legal, and social implications of genomics. His first book, Ethics After Ableism: Disability, Pain, and the History of Morality, is forthcoming with the University of Minnesota Press in 2019. With Christine Wieseler, he is co-editor of The Disability Bioethics Reader, currently under proposal review with Routledge. It will be the first general introduction to bioethics through the lens of critical disability studies and philosophy of disability. He is also co-editor, with Erik Parens, of a special issue of The Hastings Center Report on “The Gift and Weight of Genomic Knowledge,” forthcoming in winter 2019. In addition to a series of articles, his current research is developing into a new book, The Good Biocitizen: Social Justice and the Future of Health. Other ongoing projects include studies on the intersection of hermeneutic phenomenology and narrative medicine, epistemic injustice and ableism, care ethics and the “duty to know,” the history of modern medicine and bioethics, ELSI research pertaining to disability, and the role of epistemologies of ignorance in healthcare delivery. His research has appeared in the American Journal of Bioethics, Hypatia, The Hastings Center Report, AMA Journal of Ethics, Chiasmi International, The Review of Communication, and Philosophy, Ethics, and Humanities in Medicine. His public philosophy has been featured in TIME, HuffPost, AEON, and Tedx. Joel Michael Reynolds, “Toward a Critical Theory of Harm: Ableism, Normativity, and Transability (BIID),” APA Newsletter on Philosophy and Medicine 2016; 16(1): 37-45. Joel Michael Reynolds, “Infinite Responsibility in the Bedpan: Response Ethics, Care Ethics, and the Phenomenology of Dependency Work,” Hypatia: A Journal of Feminist Philosophy 2016; 31(4): 779-94. DOI: 10.1111/hypa.12292, 2016. Joel Michael Reynolds, “The Ableism of Quality of Life Judgments in Disorders of Consciousness: Who Bears Epistemic Responsibility?” American Journal of Bioethics Neuroscience 2016; 7(1): 59-61. DOI:10.1080/21507740.2016.1150911. You can also follow Joel on PhilPapers, ResearchGate, Google Scholar, SSRN, and his personal website.